The city of Waco derives its name from the agrarian Indian tribe that originally resided in the area. The Hueco, or Waco Indians were a band of the Wichita tribe that arrived in Central Texas in the 1700s. The tribe’s early history is difficult to establish because of a lack of written records due to their oral tradition. Spanish settlers first wrote of an encounter with the Waco Indians in 1772, when Athanase de Mésière noticed two villages during his trek up the Brazos River. 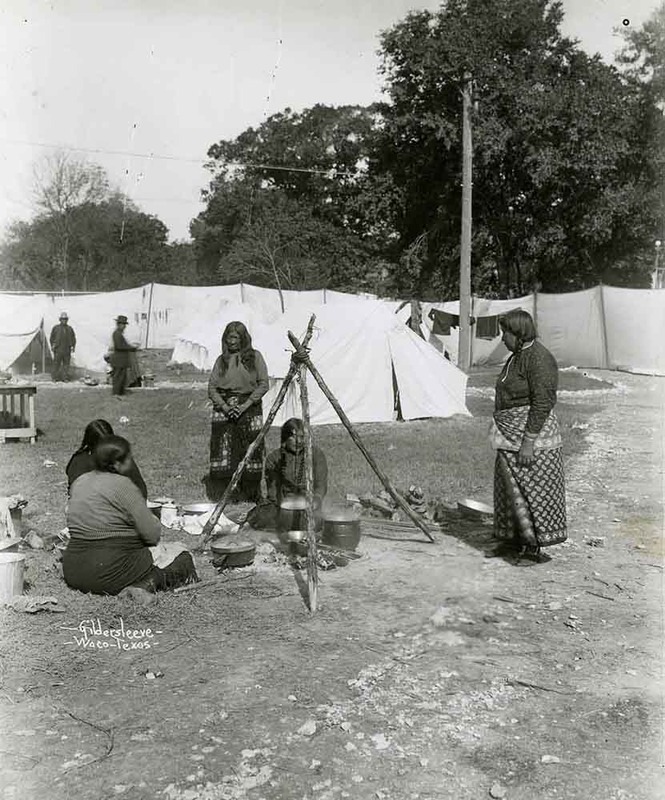 Life in Waco Indian Village centered upon the tribe’s agrarian pursuits. The Wacos farmed crops such as melons, pumpkins, lima beans, and corn. 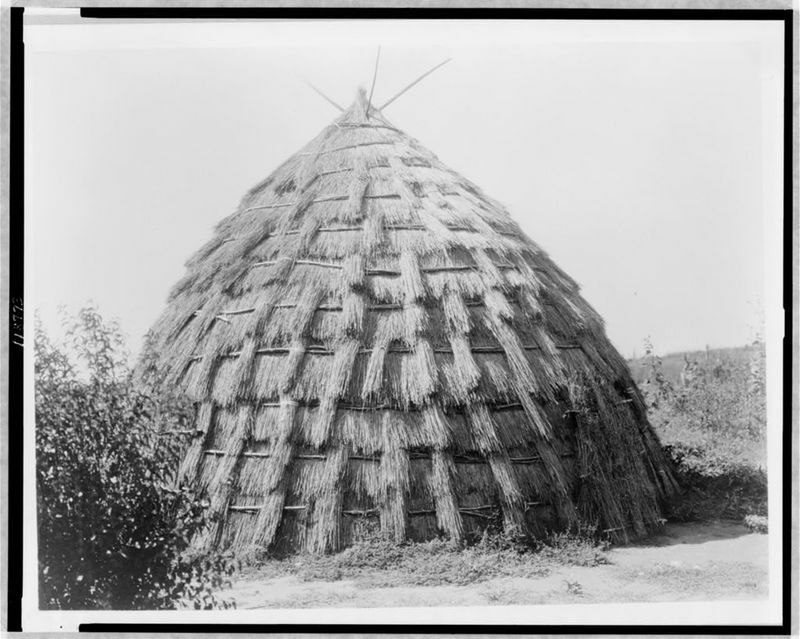 During planting and harvesting seasons, they resided in their permanent village, which consisted of beehive-shaped dwellings that were constructed from poles and thatched with grasses and willow. After harvesting the crops in the fall, the Waco Indians traveled the plains, hunting deer and buffalo in order to feed the tribe. While hunting, they lived in makeshift, temporary teepees. Tensions rose as more white settlers arrived in the area in the early nineteenth century. As settlers encroached upon their land, the Wacos raided white settlements, often stealing horses and occasionally murdering settlers. Stephen F. Austin wanted to attack the village in order to establish a colony and prevent further raids, but the Mexican government denied this request. In 1824, Austin sent a delegation to meet with the Wacos and, after some negotiation, established a peace treaty. Some accounts say that a band of Cherokee from East Texas raided the Waco Indian Village in 1829 in order to avenge some stolen horses. Others tell of a smallpox epidemic which devastated the village. Although it is not clear if these accounts speak specifically of this native settlement, it is known that a permanent Waco Indian village no longer existed upon the Brazos River after 1830. The loss of the village dealt a serious blow to the Waco Indians. Encroaching settlers forced them to move slowly farther and farther up the Brazos River. The tribe signed several treaties in the mid-nineteenth century with the US government. 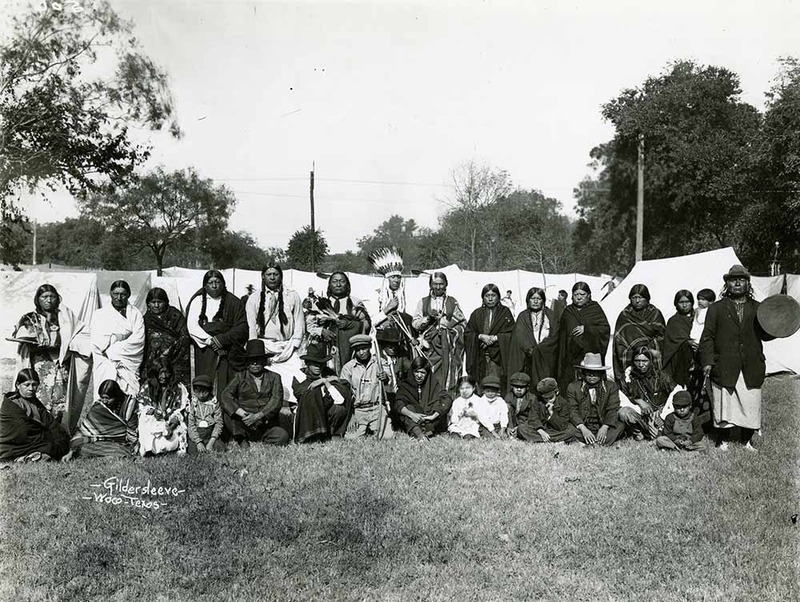 Each treaty referred to the Waco, Tawakoni, and Wichita people by the name “Wichita.” The first treaty gathered the Wichita at the Brazos Indian Reservation in North Texas, on the Brazos River, a few miles south of Fort Belknap. After a treaty in 1859, federal troops moved the Wichita to a reservation in Indian Territory in present-day Oklahoma. In 1900, the government broke up the reservation territory into individual plots, ending the Wichita Indians’ communal way of life. 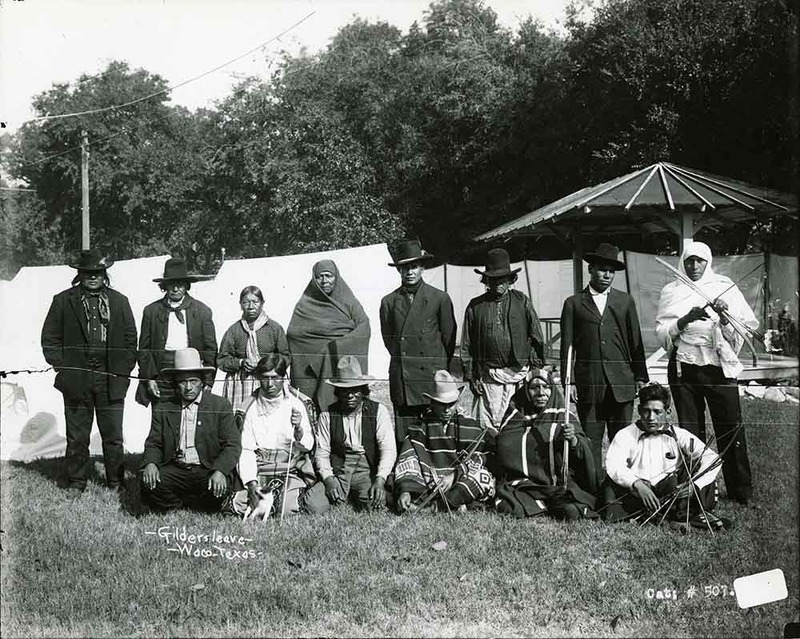 The Waco Indians became a part of the Wichita and Affiliated Tribes and continued to reside in Anadarko, Oklahoma. In 1912, Clint Padgitt brought a group of the Waco Indians back to Waco in order to participate in an exhibition at the Texas Cotton Palace Exposition. Escorted by Indian fighter John Ross, the Waco Indians resided in a fabricated village, exciting much interest and drawing record crowds. They lived in teepees, did war dances taught to them at the beginning of the exposition, and wore native “costumes,” curious combinations of modern and native clothing. Today, the Waco Indians continue to reside in Oklahoma. Several tribal leaders returned to visit Waco in 2014 for the rededication and correction of the historical marker commemorating the location of the Waco Indian Village. Waco city leaders and historians cite this visit as a start to developing a better relationship with the people who originally inhabited this area and from which the city draws its name. 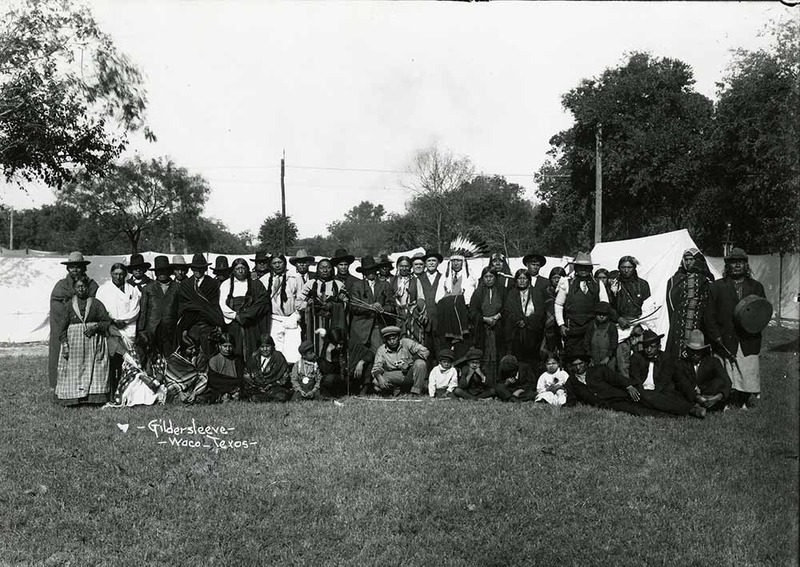 Wichita leaders believed that restoring connections with Waco was an important step in rediscovering the tribe’s roots. Amanda Sawyer, “Waco Indian Village,” Waco History, accessed April 26, 2019, https://wacohistory.org/items/show/46. Claridy, Christina. “Indians and Rangers in 19th Century Texas.” Texas Ranger Research Center. Accessed December 4, 2014. http://www.texasranger.org/ReCenter/Indian_Rangers_Smith.html. “Days of Darkness: 1820-1934.” Wichita and Affiliated Tribes. Accessed December 15, 2014. http://www.wichitatribe.com/history/days-of-darkness-1820-1934.aspx Kelley, Dayton. The Handbook of Waco and McLennan County, Texas. Waco, Tex. : Texian Press, 1972. 84.Smith, J. B. “Tribal Leaders Rededicate Monument to Waco Indian Village.” Waco Tribune. October 10, 2014.